Are you planning on visiting the Old Tuscon Studios in the future. As a SASS member, you now have free admission. Old Tucson Studios and SASS – a match made in movie heaven! Old Tucson Studios, home to more than 300 movies and shows, has been steeped in the Hollywood western tradition since 1939. Cowboy Action Shooting was created in 1981 by Harper Creigh an avid shooter who, while watching old westerns, was inspired to create a shooting match using western-type guns. Today’s Single Action Shooting Society, an international organization, stages shooting matches and endorses matches conducted by affiliate clubs. In the spirit of the Old West, SASS match participants sport shooting aliases, costumes, and firearms reflective of the period. 1. Members must be dressed in period costume with a SASS badge and must present a current SASS ID card. 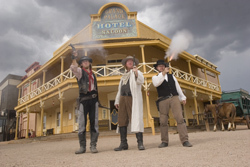 So come out and spend a day in the Old West, complete with gunfights and stunt shows, dance hall musicals, and rides for the kids. Pan for gold, tour our movie museum and chow down on authentic chuckwagon barbecue. It’s a fun-filled day at one of the west’s most famous and still-active movie locations. Old Tucson Studios – Celebrating 70 years of Western Movie Magic. This is terrific news! I was just mentioning how they should discount your tickets if you show up in period clothing since it adds ambience to the park.